Once upon a time in a far-away land, crate style furniture was trendy and fashionable. So, maybe not a far-away land but certainly crate style furniture was popular in a past time. I recall the first time I saw a crate style living room at my cousin’s house in the 70’s. The boxy seating pieces were intriguing to me; clearly born from practical & rugged shipping crates but when outfitted with overstuffed cushions, the seating ensemble somehow achieved a comfy, homey look. Today, crate style has trimmed down and taken a major fashion forward step into the present. The thick, boxy lines of crate of old have been replaced with a slimmer profile while still maintaining the practical durability that made the style appealing. Today’s crate pieces can be constructed with sleek, solid panels or with more refined mission styling. Finish options range from classic honey brown to contemporary cherry. Add to that a set of inviting, comfortable cushions and you have a classy, fashionable seating piece that you can be proud to use in your health care, education, hospitality or recreation facility. What has crate style given up during its transformation from boxy and (potentially) embarrassing to trim and sassy? Well, nothing! Crate style is still the most rugged and durable seating on the market. 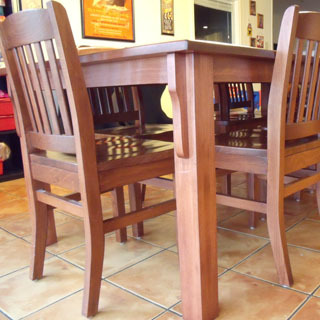 It is constructed of solid wood that can take serious wear and tear. Cushion sets can be assembled from any fabric - from traditional to trendy - and can easily be changed out over time as style trends change. The result? Crate style offers any health care, education, hospitality or recreation environment a stylish and flexible seating solution that will outlast any other upholstered option.